Tuesday night I had the opportunity to watch The Belly Dance Superstars live in action at the Eastmonte Civic Center in Orlando. What a delightful treat it was!! After the show I was absolutely mesmerized. I was actually so speechless that it has taken me 2 days to write my review of the performance. 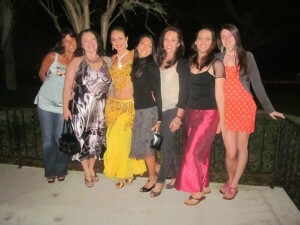 The first half of the show included performances by Orlando Belly Dance. The opening act had no other then Yana Maxwell, my belly dance instructor, front stage and center setting the mood. She is always so incredible to watch that none of her students would ever be able to keep their eyes off of her to notice if anyone else was on the stage. There are different schools within Orlando Belly Dance. My instructor preforms out of Orlando Dance Theatre which focuses on Cabaret style- successively the style I have primarily been schooled in. There were also beautiful performances by Ahlaam dance company, Gypsy Sa’har, and Serpentine. Being a neophyte myself in the world of belly dance, I was able to learn a lot by observing the ladies in these troupes move. There was a brief intermission that consisted of taking pictures with the ladies of Daytona Beach Belly Dance and looking through the vendor merchandise of DVDs, CDs, hip belts, jewels, and clothes. Shopping was fun but I did not purchase anything. Skillz that Pay the Billz sounded like just what I needed but at $20 I knew I could do better. The second half of the show was absolutely phenomenal. It was very inspiring for me to watch these women move their bodies in such amazingly incredible ways. Moria and Sabrina were the tribal fusion style performers who really stole the show. Stefanya, Lauren, and Sabah were absolutely gorgeous and their fluid moves appeared authentically traditional. I did find it improbably though that these women with golden blond hair had a drop of middle eastern blood in their bodies even if their names might suggest otherwise. Petite Jamilla, the one classically dark haired Belly Dance Superstar performed a sorrowful piece that almost brought tears to my eyes. Who am I kidding though, there were several times throughout the show that I felt choked up with emotion. When the show was over the audience had a chance to meet and greet with the performers. I lurked around a couple of the dancers but then couldn’t think of anything too gushingly fanatic to say and chickened out. I just drooled at them from a distance. I’ve come to accept the fact that I may never be a Belly Dance Superstar and tour across the world for royalty with my grace. I have been completely inspired though to really step up and put more effort into becoming super shimmylicious. This show was just what I needed to get my head in the game. Nice blog, honest and genuine. Hope to see you again sometime! You are my aspiration, I own few web logs and sometimes run out from post . “Fiat justitia et pereat mundus.Let justice be done, though the world perish.” by Ferdinand I. At my studio there is Ballet I would walays do a ballet even if you don’t really like it because its the stem of all types of dances and it will make you a better dancer, Jazz- fun but if you are going to preform it i would put a lot of energy into it because it completes the whole dance, Tap- you take it but its also a lot of fun if you get a cute song and put in a lot of energy, Hip-Hop- very fun but is very stiff or very loose depending on the style, Lyrical- again you already take it but theres so much you can do if you really feel it, Musical Theatre- so much fun if you just let loose and have fun: its any type of dance but with some mouthing or saying the words and mostly done to musicals like hairspray or wicked, Modern- I’m taking a modern this year and really love it. its soo much fun and its different which is what i like about it, and finally Acro- (only some studios offer this) its dancing with flips and other gymnastics-like moves but is alot of fun to do. I hope i helped!